Nicole met Ryan when he was a handsome, cocky teenager with a desire to fly high above the clouds. Ryan encouraged Nicole to dream big and promised her a lifetime of happiness, but several years into their lives together, they were faced with obstacles bigger than either had ever imagined. Their love faltered. They lost their way and considered what had once been unthinkable -- the end of their forever. But now fate throws them a curve, an event that forces them back together, that strips their emotions bare and is both terrifying and strangely unifying. For the first time in a long while they have to face each other, and not only talk but also listen, because their lives depend on it -- not only their lives, but also the life of their six-year-old son. 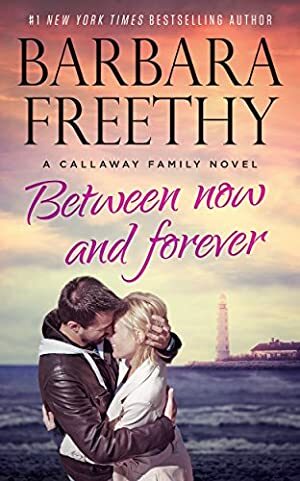 *Fans of Barbara's Angel's Bay Series, will enjoy the secondary plotline in Between Now and Forever which takes the Callaways to Angel's Bay! Can't Let Go (#5) Coming Soon! Track It. This book has been $3.98 within the past year. Log In to track Barbara Freethy on eReaderIQ. to be notified each time the price drops on any book by Barbara Freethy. to stop tracking Barbara Freethy. We started tracking this book on October 23, 2013. The price of this book has changed 30 times in the past 2,008 days. The current price of this book is $5.99 last checked 3 months ago. This lowest price this book has been offered at in the past year is $3.98. The highest price to date was $5.99 last reached on May 18, 2018. This book has been $5.99 5 times since we started tracking it. We last verified the price of this book about 3 months ago. At that time, the price was $5.99. This price is subject to change. The price displayed on the Amazon.ca website at the time of purchase is the price you will pay for this book. Please confirm the price before making any purchases.